Kiss and Cry opens at the Carlton Theatre Feb. 10 with additional theatres to be announced soon. Carley Allison was a gifted and promising young Toronto woman on the brink of adulthood. She was a skater and singer and about to enter college when she contracted cancer at the age of 17. She had a variety of clear cell carcinoma cancer so rare it hits 1 in 3.5B people; the outlook was grim. Yet through the treatments, the all-clear signs, the return of the disease and the deep impact on her family and friends, and her own sense of being, Carley chose to smile. 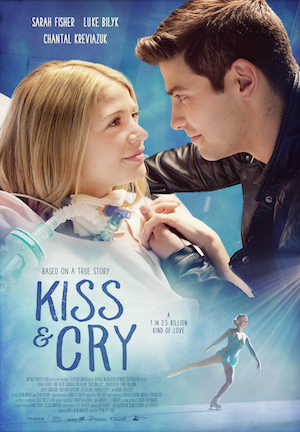 Carley’s real life best friend, actress and associate producer Sarah Fisher (Degrassi: the Next Generation) brings her story to vivid life in Sean Cisterna’s powerful biopic Kiss and Cry a tribute to her friend and a reminder for us to focus on the positive. Allison was a unique individual whose bright spirit and refusal to give in transformed her journey and the lives of others. I was a mess watching Kiss and Cry but I want to stress that it is not a sentimental film. It’s ferociously positive. One thing that I think a lot of people expect coming in to the theatre to see the film is that it’s going to be very heavy. Carley would always tell her sister Riley that her story is not a tragedy and she couldn’t be more right. It’s a story to inspire and the farthest thing from a tragedy because in so many ways, Carley absolutely won. You play Carley who was your real life best friend. I’m sure it was a huge responsibility for you to balance and cope with the emotional weight and desire to get it right? It was a lot of things. I wanted to make sure that we were telling Carley’s story the way she would’ve wanted it to be told. Not shying away from the truth of what it may feel like or look like to be dealing with cancer. Some scenes were very personal to me as I shared some of the moments in the film with Car in real life. I will never play a role that is this close to home and that means this much to me again. It would be hard to match it in terms of being such close friends with Carley. I saw a completely different side to what Carley was going through because I had to imagine when everyone leaves the room and Car had a million visitors all the time, how does she feel then? How she was able to keep everyone around her so safe and happy? I dove into the work of trying to explore what she could have been feeling when she was left alone, with the weight of knowing her situation. But Carley never made it about herself. You had to ask hard to find out how she was feeling. It was about making everyone around her happy that’s what she cared about most. Was it ever painful for you, going back there? All Carley ever cared about was the people around her. She had a way of making you feel special and important and loved. She never made it about her. So whenever Carley would tell us she felt fine, we had to believe her, because it made it easier for us to be around her and not be upset. Sarah Fisher in Kiss and Cry. So when I was preparing for this role I had to think about for example, finding out she had cancer and then finding out that it had come back and spread to her lungs, these were some of the scenes where I had to revisit those moments, but in the mind of Carley. Feeling the tiniest piece of how that must have felt I truly have no idea how Car handled it the way she did. With absolute strength, bravery, grace, boundless optimism, love and a perfect smile on her face. The smile. Casey insisted on maintaining a positive attitude despite it all by saying “I choose to smile”. That’s powerful. 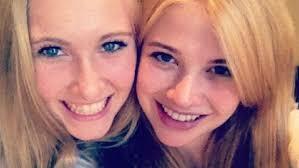 Sarah Fisher & Chantal Kreviazuk in Kiss and Cry. She overcame cancer by smiling. Car overcame cancer with her ability to make everyone around her feel loved and special and important and I can truly say that she fought with incredible strength and grace and really there was not a doubt in her mind, it was incredible. There are no words to explain or to understand what she did, to honestly fight a rare cancer with a genuine smile on her face, caring. Everything she wrote is on the blog. When I speak directly to camera, those words are Carley’s words. This is Carley Allison’s real story down to the words she wrote. I still cannot believe she was able to do it. Carley was asked to try writing a letter to herself from Cancer as a therapeutic exercise. Carley wrote in her letter that Cancer didn’t want to hurt her. To be able to make peace with the thing that is hurting you most shows incredible strength. To be able to say that and feel that, forgive it, understand it’s not trying to do anything bad. To say those words to something you have no control over that’s breaking your body down from the inside… how do you find it in your heart and mind to see the other side of that and truly believe it didn’t mean to hurt you? That’s the power she had. There is no story about Carley Allison that won’t be inspirational and breathtaking. Every bit is true. Car was a huge role model to other people dealing with cancer, she supported online and connected with bunch of different accounts that were promoting awareness and raising money to help people. I understand the film was shot at Carley’s North Toronto home and in her own school and her friends and family appeared in the film. It just makes it makes it that much more real. We shot in Bayview Glen School where I met Carley and we filmed in her home and her bedroom where I spent a lot of time with her as well, and The Cricket Club where she trained. Honestly, all of Toronto opened its arms to us the second they heard the name Carley Allison. Even the Air Canada Centre and the Leafs opened their doors and allowed us to film me singing the national anthemat a live game! Car sang for the Leafs twice. She makes this stuff happen and people bent over backwards to help us. There were early screenings to coincide with World Cancer Day for friends and family. How did they go? It was magic. Without a doubt in my mind, Car was there. The whole time. Even people who never met her or were never onset felt her spirit and brightness were present. That’s why I think this film was so much more than another job. It was truly family. Car’s family opened their doors to us and their very personal life and touching story. I was so in love with the story. Director Sean Cisterna says “We are very proud that a portion of the KISS and CRY’s proceeds will go to Carley’s Angels, a foundation, established by the Allison family, dedicated to helping sick children and their families manage complicated and costly healthcare issues”. To donate, or learn more about Carley, visit teamcarley.ca .